I can’t help but feel some excitement as an extremely meaningful event starts to approach.The NW Sarcoma Foundation Dragonslayer 5k Run/Walk/Bike.I’d love to gather up everyone who’s willing to participate and form an awesome Team Kick ASPS! My family and I discovered this fantastic fundraiser about 2 years ago, the summer following my diagnosis. I can still remember the beautiful, explosive, tie-dye color of the T-shirts every team member sported that first year. Though different people may attend, and different things may be worn, I know that the event this fall will still overflow with the same pulsing energy, love, & fighting spirit that it always brings to Cook Park. It hasn’t exactly been easy for me to attend and participate in the Dragonslayer each year. The first year, I showed up with a pair of crutches and a wheelchair, due to a newly operated on dislocated hip. I felt triumphant and proud as I swung myself across the last stretch, crossing the finish line with all my family and friends cheering me on.The second year, I was barely able to squeeze out a pass from my doctors, but fortunately got to break free from the hospital for the beloved event. My arm was in a sling, I was tired from head to toe, and I still needed the wheelchair at some intervals, but once again I made it across the line with a crowd of loving people pushing me onward. This walk, run, and bike, has never been a “piece of cake” for me, from getting there to completing it, but I love it wholeheartedly. Maybe it’s the good feelings it brings to all who participate. Maybe it’s being surrounded with kind friends and family, giving me strength for each step I take. And maybe it’s the knowledge that everyone here is slaying the dragons of sarcoma, especially myself when I make it to the fun run despite the fire balls cancer is throwing at me, trying to get me to accept defeat. I feel great when I take on the challenge and fight the monster trying to attack me. 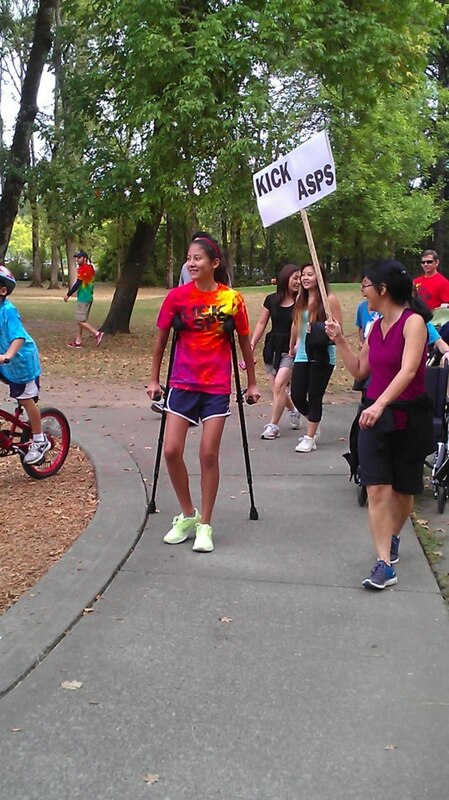 So I’d like to throw out a challenge to all reading this right now: Please participate in this run/walk/bike on Team Kick ASPS! I am so grateful for all of the love I’ve received in the past years from everyone who has taken the time to come out and support me in this event. Everyone of you are heroes, making a possible life saving choice for others. That’s because, not only is the Dragonslayer a fun way to get exercise, one of the best parts of this amazing event is that it raises money for sarcoma research, one of the rarest and least known about cancers! Sarcomas need this precious research the most in order to save lives! So even if you are not able to attend the Dragonslayer, I’d be beyond appreciative if everyone could please, please donate and support the team’s goal of $2,000 this year. This cause means everything to me. The Northwest Sarcoma Foundation is a wonderful, generous, non-profit organization that dedicates its heart and soul to raising money for important research. So what do you say? Will you come out and slay some dragons this September 13th? Because I know for sure that I’ll be there, summoning up my strength to kick some major ASPS! There aren’t a lot of issues that I get really fired up about, and if there’s one thing I hate, it’s being in the spotlight with all eyes on me. I’m a naturally shy and quiet person, so usually lots of attention makes me squirm. But the situation I’m about to describe is one that I can willingly shrug my shyness off for and be passionate about. That’s because this could affect the future, cancer research development, and children’s lives, including my own. It made me so frustrated, shocked, and angry when I found out that for every dollar given to the National Cancer Institute, only 4 cents goes towards children’s research. I found myself realizing why there were so little treatment options besides the standard chemotherapy or radiation regimen. Put simply, there just isn’t enough money or time spent on new research for pediatric cancers! I’ll be honest and say that before I was diagnosed, I didn’t know anything at all about this situation. I was blind to the struggle that young patients with rare cancers were having to go through. And since children only make up a small percentage of those diagnosed with the disease, their voice is pretty difficult to be heard. Very few know the extreme difficulties these patients and their parents are having to face. But now, as a fighter of ASPS for over 2 years now,…I know. And I’m going to do everything I can to pull back the curtain of silence on the world of pediatric cancer. Lack of knowledge has been stifling its voice for way too many years now. So today, I’m writing this post to attempt to shout out awareness and make the reality of being a pediatric cancer patient known. I want to speak not just for myself but for all kids battling cancer, especially the brave, inspiring, and amazing ones who have died fighting against these impossible odds. Because I’ve been thrown into a complicated world of clinical trials and experimental drugs, I find it hard to comprehend the rules of this system we have created ourselves. When a company denies a patient of a medicine that may be their only chance of survival, it’s near impossible to side with their decision’s reason. Yet this has happened time and time again. When it comes to children’s lives, I believe they should be allowed to have access to the few treatments that are available to them. Of course, I’m very biased, but this appears to me like an ethical decision. So this is the dilemma my family and I are in now. We have asked multiple times for Compassionate Use of PD1/PDL1, a promising drug for my highly rare cancer, from Merck, Genentech, Bristol Meyers-Sqibb. Why so desperate? Because we’re constantly reminded of the time ticking by. With every morning that I wake up in excruciating pain, every time I feel sick to my stomach, every time we go through a tough scan. We’re there, staring it directly in the face and watching the terrible things cancer can do. And we’re not the only ones, because many other families are going through the exact same stress. But for each time we’ve asked, we’ve also been denied, coming out empty handed. With the help of friends: We’ve made pleas with both homemade and professional videos. We’ve written tons of amazing letters to each of the drug companies. We’ve been on TV for several local stations, explaining our story. We’ve communicated with congress members, drug company employees, anyone you can think of. We’ve blown up social media with Facebook, Instagram, & Twitter. There are so many amazing people supporting us, working as hard as they can to try and make a difference. Yet with all of these efforts, the companies we’ve cried out to have met us with little to no response, all because of “set in stone” rules. We have to realize that the people in the companies aren’t the enemy. We’re fighting against a faulty system of clinical trials that needs to be rethought and adjusted. It’s frustrating. Discouraging. Unfair. There’s been a lot of stress, tears, and pain. We’re tired but we’re not giving up. 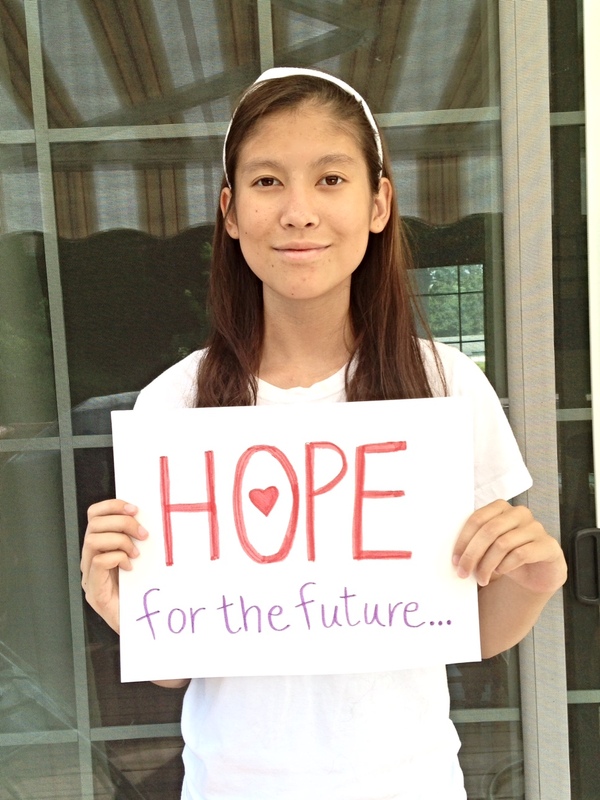 I have hope for pediatric cancer research, and I have hope for myself. I’m stubborn, determined, and have grown stronger through all of this. I don’t throw in the towel easily. Right now, though it seems like we’re one tiny fish in a gigantic ocean, one small voice in a crowd of millions, I will continue to fight with the hope of making a difference. After all, change begins with a whisper.